Off to the Surf n Ink International Tattoo Convention! 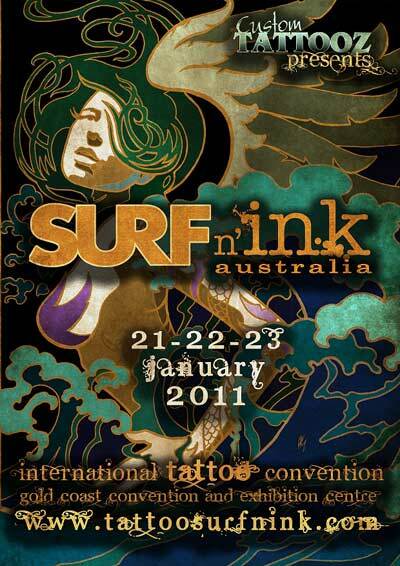 Im very excited to be heading to the Surf n Ink international tattoo convention today! It will be a lot of travel, but hopefully well worth it. I'll be giving a seminar on the power of TattooNOW websites as well as schmoozing for the Paradise Tattoo Gathering. Speaking of the Gathering, I'll be organizing the seminar schedule on the way over, artists are already making plans and contacting me about specifics, ack! Things at Off the Map Tattoo are cranking, and our guest artist list is pretty much full for 2011, save for a coupla surprises here and there Im sure. Well, enough chit chat, I gotta huslte the rest of my tasks, including fixing my car to get to the airport, so if you are in Oz, catch up with me at the Surf n Ink show!